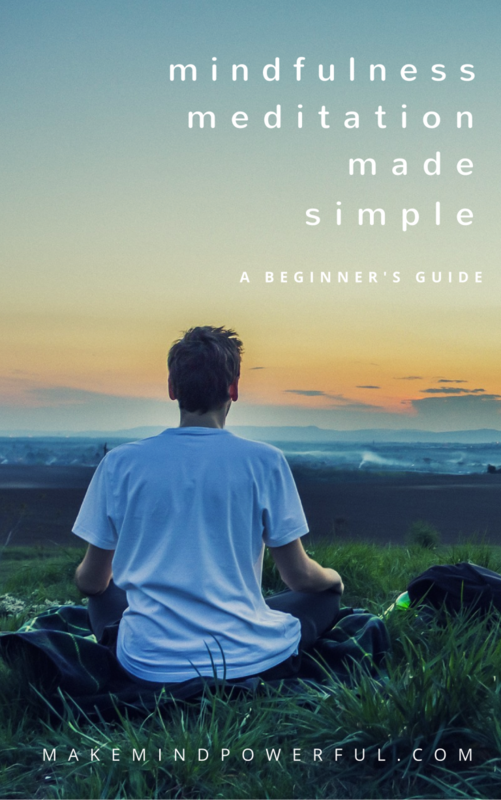 When you’re trapped in the endless hustle of a busy lifestyle, you’ll pay anything for a short moment of inner calmness. Thankfully, you don’t need to break the bank for relaxing with myrrh essential oils. As one of the most commonly used essential oil, myrrh helps you to relax and is a great companion for meditation. The myrrh essential oil has a colorful history that stretches back to thousands of year of civilizations. 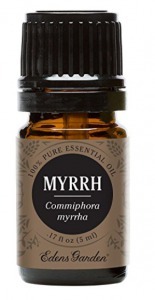 Extracted from trees that belong to the Commiphora family, myrrh is a sap-like substance that is believed to be first used by the ancient Egyptians. During the ancient days, myrrh has been used for embalming by the Egyptians. The Chinese later discovered the therapeutic properties of myrrh and it still remains part of modern days Chinese medicine practice. Myrrh was also mentioned in the Bible. The dried resin of myrrh was also used by the Jews in religious ceremonies. The widespread use of myrrh that transcends civilization and time speak highly of its therapeutic qualities. Various essential oils are known to promote relaxation and stress relief. While myrrh may not be highly popular for its calming ability, it is one of the most preferred essential oils for meditation practitioners. Myrrh has a sweet smoky aroma that hints of its medicinal quality. The therapeutic properties of myrrh can be attributed to terpenoids and sesquiterpenes that forms the active compound of the oil. Both compounds have attracted scientific investigations of their strong anti-oxidant, anti-inflammation, and potential anti-cancer properties. The sesquiterpenes play an important role to promote calmness by positively affecting the hypothalamus that regulates emotion. Studies have also positively confirmed the anti-anxiety and anti-depressive properties of myrrh. 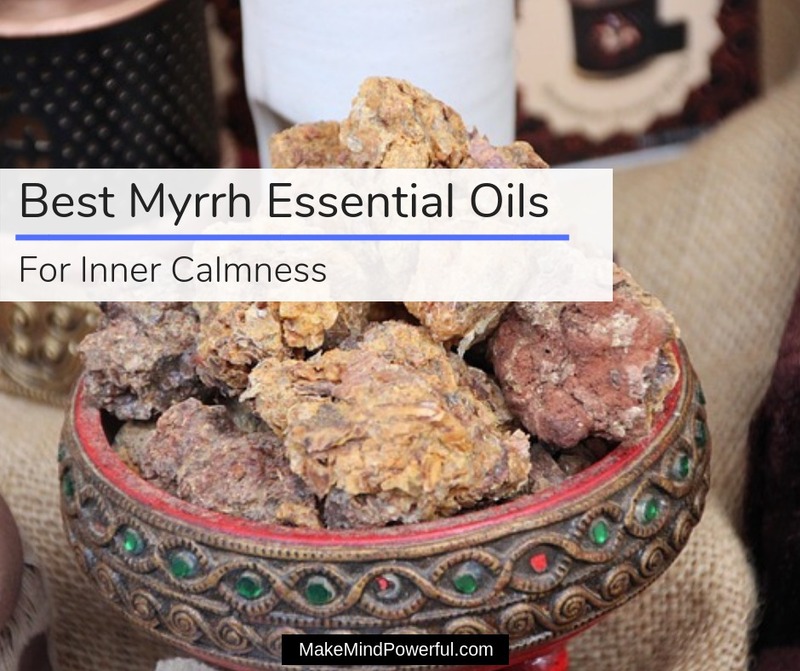 The scent of myrrh essential oil may bring inner peace to a troubled mind. But there are other equally valid reasons to use myrrh essential oil for your health. 1. Great For Regulating Skin Health. Myrrh is well known for its ability to promote youthful and healthy skin. A study published by the King Saud University, Saudi Arabia has indicated the ability of myrrh in increasing the white blood cells to reduce the healing time for skin wounds. Individuals who are suffering from bacterial or fungal infections like ringworm can benefit from using myrrh essential oil. A scientific study has shown the potency of myrrh’s antibacterial property, by effectively targeting drug-resisting Staphylococcus aureus. Another study shows an impressive synergistic effect in the anti-bacterial property when myrrh is blended with frankincense essential oil. Parasitic infection like fascioliasis affected populations around the world. It was caused by ingesting larvae of the parasitic worm and affects the liver. A study published in the The American Society of Tropical Medicine and Hygiene has found myrrh essential oil as an effective treatment for fascioliasis. Perhaps one of the most intriguing benefits of myrrh essential oil is the anti-cancer quality it exhibits. A clinical study conducted by researchers in China has shown promising results where myrrh essential oil is suppressing the growth of gynecologic cancer cells. This opens the door to future researches to fully understand and apply myrrh as a natural cancer treating remedy. Do not ingest myrrh essential oil unless adviced by your doctor. A large dose of myrrh that exceeds 2-4 grams can irritate the kidney and causes irregular heartbeats. Taking myrrh orally is also known to cause diarrhea. Avoid applying undiluted myrrh oil directly to the skin as it may cause skin irritations. Individuals taking medications for diabetes should avoid using myrrh as it may further lower their blood sugar. Myrrh may cause the fever to worsen. You’ll want to temporarily discontinue usage during fever. Myrrh can potentially disrupt the heart rate in large dosage. If you have heart problems, consult your doctor about using myrrh essential oil. Discontinue usage of myrrh at least 2 weeks prior to a surgery as it may disrupt the blood glucose level. People with systemic inflammation may want to alert their doctors on using myrrh as it may cause the condition to deteriorate. Do not use myrrh if you have uterine bleeding as it will aggravate the condition. Pregnant and breastfeeding women should avoid using myrrh essential oil to be on the safe side. General precautions when using myrrh essential oil. You’ll also want to avoid direct contact of myrrh essential oil with sensitive areas like eyes, nose, and ears. Store the essential oil in a safe place and out of reach of children. Avoid direct exposure to sun and UV as it may destroy the active compounds of the oil. To reap the benefits of myrrh essential oil, you can use it with a diffuser or apply it topically. It’s important to choose a diffuser that does not use heat as it will compromise the properties of the essential oil. Ultrasonic and nebulizer diffusers are ideal for dispersing essential oil to your room. Add a few drops to the water in the diffuser and wait for the myrrh droplets to surrounding areas. Your body will start to show positive effects after inhaling the myrrh vapor. Some individuals may prefer the topical use of myrrh essential oil. Always bear in mind that undiluted essential oil should never be applied directly to your skin. Doing so may trigger side effects like rashes or redness on the skin. Instead, mix myrrh essential oil with a carrier oil (1% – 3% dilution) like jujube, grapeseed or fractionated coconut oil before applying to your skin. Alternatively, you can also add a few drops of myrrh oil to lotion to boost your skin health. Either way, it is important to rub some of the diluted oil on your elbow to check for any signs of allergies. If there are irritations or rashes after a few hours, stop using myrrh oil. Extraction method – To ensure that the oil maintains the therapeutic properties of myrrh, only choose myrrh essential oil that is extracted via steam distillation. Purities – A high-quality myrrh essential oil should be pure, undiluted and free from any additives and impurities. Check for the standards use in testings by the manufacturers. Bottles – Essential oils are normally shipped in amber glass bottles that protect against UV. You may also come across claims by manufacturers that their essential oils are of ‘therapeutic grade’. This phrase offers little meaning as there were no regulations to justify it. Instead, the manufacturing process and quality control of the manufacturers are what really matters. As myrrh essential oil is commonly used around the world, various manufacturers strive to put forth their products on the market. To help you in making a choice, I’ve narrowed down the list to some of the best myrrh essential oils that enjoy encouraging feedbacks. Plant Therapy was founded by Chris and Amanda as a family-owned business. It realizes that there is a need for pure and effective essential oils in the market that is priced affordably. It took a people-centric approach in making high-quality essential oils, including its range of KidSafe products. This bottle of essential oil contains 15ml of potent natural oil extracted from the Myrrh tree. It was steam distilled to preserve the properties of the oil and contains to traces of fillers or additives. This is further verified by multiple rounds of testings by essential oil experts and laboratories alike. To start using the essential oil, you can dilute it in a diffuser to disperse the calming scent in your room. Alternatively, you can also dilute the myrrh essential oil with a carrier oil before applying on the skin. It helps to reduce blemishes and soothe sensitive skin. GC-MS tested by multiple laboratories. Steam distilled for maximum potency. Promotes calm and uplifting atmosphere. Some individuals dislike the scent. Artizen sought to offer premium grade essential oils for the ordinary consumers without the inflated price of multi-level marketing companies. To do this, it builds great relationships with the best essential oil suppliers in the world. You’ll be getting the same premium quality of essential oils sold in small boutiques. 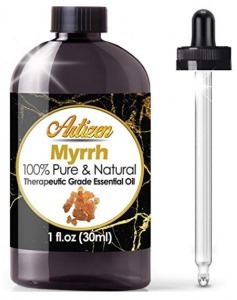 You’ll be assured of the highest quality of myrrh oil with this bottle of essential oil by Artizen. There are no additives in this pure undiluted myrrh essential oil. Besides undergoing regular testing, the essential oil is protected by UV-coated glass bottle against sun exposure. The bottle is shipped with a premium glass dropper that lets you add the oil easily into a diffuser. As the myrrh oil droplets are spread in the air, the earthy aroma will start soothing your senses. The nice and thick viscosity of the oil points to the premium quality as promised by Artizen. 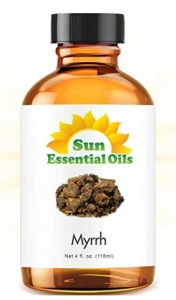 High quality and potent myrrh oil. Tested for impurities and UV protection with a special coated glass bottle. The scent may be overwhelming for some customers. Sun Essential Oils is operated by a small team of essential oil experts who love what they are doing. Due to its low overhead, the company is able to produce superior quality essential oils at an affordable price. It takes quality control seriously and its team is keen users of the essential oils produced. This large bottle of essential oil is extracted from the myrrh resin that is harvested from the best sources. There are no harmful chemicals involved in the process and it is one of the most potent myrrh oil on the market. The natural scent of myrrh that emanates from the oil will soothe any irritability and fatigue that can result from various stressors in your life. You can use it in your bath, massage or diffuse it for a relaxing aromatherapy session. It is also a great essential oil to use in meditation. Sourced from the finest myrrh trees. Great for lifting a mood. Some buyers prefer stronger scent than this. Plant Guru is a no-nonsense essential online company that was founded online and operated by a small team of family members. It was born to provide alternatives to expensive and inferior quality essential oils commonly promoted by multilevel marketing companies. 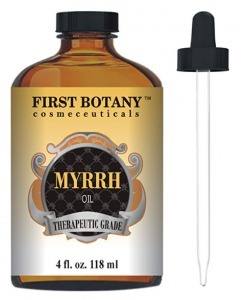 You can expect one of the most potent essential oils that are produced with strict quality control with this bottle of myrrh oil from Plant Guru. Each bottle of myrrh oil produced by the company is guaranteed to be pure and natural with no additive or fillers. The oil was steam distilled by the finest resin of Commiphora Myrrha plant. As the oil evaporates, you’ll get a whiff of rich and spicy balsamic scent that soothe stress away. You can also apply topically for skin health by diluting it with a carrier oil with 3 to 5% dilution. Strict quality control to ensure purity. A pleasant earthy scent of myrrh. Undiluted and potent myrrh oil. Not for individuals who prefer sharper myrrh scent. Gya Labs take the best of technological advancement and mother nature to produce a superior grade of essential oils. Besides harvesting only the finest raw ingredients, Gya Labs uses cold press and steam distillation technique to ensure the natural potency of the oil is retained. 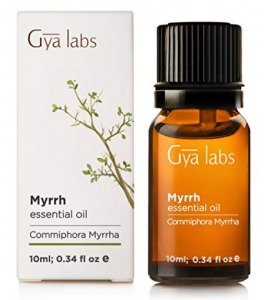 When it comes to quality, Gya Labs’ myrrh essential oil is arguably one of the best. It is extracted naturally from the resin of Commiphora myrrha plant with a process that preserves its therapeutic properties. This is all done in an FDA-approved GMP and ISO9001 compliance facility. This is a great essential oil to ground your thought in meditation and also a great natural skin care remedy. You can benefit from the healing properties of this myrrh oil by inhalation through aromatherapy or applying it topically on your skin. Produced in GMP certified facility. Some buyers prefer a stronger scent. Edens Garden is a recognizable brand in the essential oil industry. It was founded in 2009 and operates out of a tiny garage. Since then, it has established itself as one of the most trusted brands, as it focuses on improving product quality rather than marketing. Expect freshness and quality with this bottle of Edens Garden myrrh essential oil. Each bottle of essential oil went through multiple testings to comply with the GC/MS certification. Rest assured that no fillers or additives are present in this undiluted essential oil. Its therapeutic properties were continuously preserved during storage as it was protected from light and stored at the right temperature. As you diffuse the myrrh oil, you’ll be greeted by a woody and smoky scent that does wonder to alleviate multiple ailments. Some buyers felt the aroma is too weak. doTERRA was founded in 2008 with a mission to deliver therapeutic grade quality essential oil to the public. It goes to the extent to establish the standard that defines the purity and potency of an essential oil. Today, doTERRA essential oils are used by wellness practitioners around the world. If you’re looking for the cheapest essential oil, you’ll want to skip this item. However, doTERRA is known for its superior quality that justifies its premium price. When added in a diffuser, the smoky scent of myrrh helps to ground your mind and promote clarity. 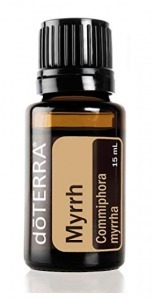 You can also use this myrrh oil to treat microbial infections, particularly for the mouth and throat. This myrrh oil is also great for rejuvenating tired skin. Dilute the myrrh oil with a carrier oil and apply to your skin to promote a smooth, youthful complexion. First Botany is an online based company that specialized in providing safe and natural skin care products. It thoroughly researches what works and turned them into effective products that are loved by customers of all genders and ages. No animals are harmed in the production of this myrrh essential oil. Besides that, First Botany ensures that no fillers or harmful chemicals are present in the oil. It has a rich woody scent that creates a calming experience for the mind. You can also use this myrrh oil as part of your skin care regime. It helps with fading scars and spots away when used topically, You can use the glass dropper provided to accurately dilute the myrrh oil in a carrier oil before applying on your skin. Helps in fading scars away. No additives, fillers and cruelty-free. Great natural skin care remedy. It has a weaker scent than other popular brands. Aviano Botanicals is a family-owned company that believes in sourcing and providing 100% pure and natural essential oil to its customers. It was based in Texas but hunts for the best essential oils from around the world. The myrrh resin used to produce this bottle of essential oil was sourced from Saudi Arabia. It has a rich strong scent that is associated with myrrh. This product has lived up to the reputation of myrrh in alleviating skin problems. The bottle has a euro dropper cap that can be used to accurately dilute the myrrh oil in a carrier oil. Applying the myrrh oil on skins with rashes or scar will help to promote healing. You can also use it for aromatherapy as the earthy scent induce a refreshing feeling when inhaled. Harvested from Saudi Arabia, that is known for the finest myrrh trees. Some buyers dislike the scent. Aura Cacia is part of Frontier Co-op and started producing essential oils in 1982. Its ingredients are sourced from botanical farms around the world and are tested to ensure they are pure and of superior quality. It believes in creating positive change in the world and has launched an annual grant program to help women and girls. This bottle of myrrh essential oil by Aura Cacia is guaranteed to be 100% pure. You can diffuse it during your meditation routine as its warm and spicy balsamic aroma provides a great centering for restless thoughts. The essential oil is extremely potent and helps to rejuvenate your skin when diluted and applied topically. Besides skin health, the oil can also be used as a mouthwash thanks to its cleansing effect. The bottle comes with a child-safety cap to prevent accidental exposure to children. Undiluted potent myrrh essential oil. Helps to center thoughts in meditation. The safety cap may get stuck. Myrrh oil is great for its uplifting properties. It is also a potent skin rejuvenation property. I hope that this detailed guide has narrowed down your selection of the right myrrh essential oil. Share your experience of using myrrh essential oil in the comment below.